Are you tired of popular, “must-see” holiday destinations being clogged with so many other travelers that you find it hard to relax and enjoy yourself? Try going down a path less traveled and head to Kampot, a sleepy city on the river. From Phnom Penh to Kampot is an approximately three-hour drive southwest. The most affordable way to travel to Kampot (from anywhere in Cambodia) is by bus. 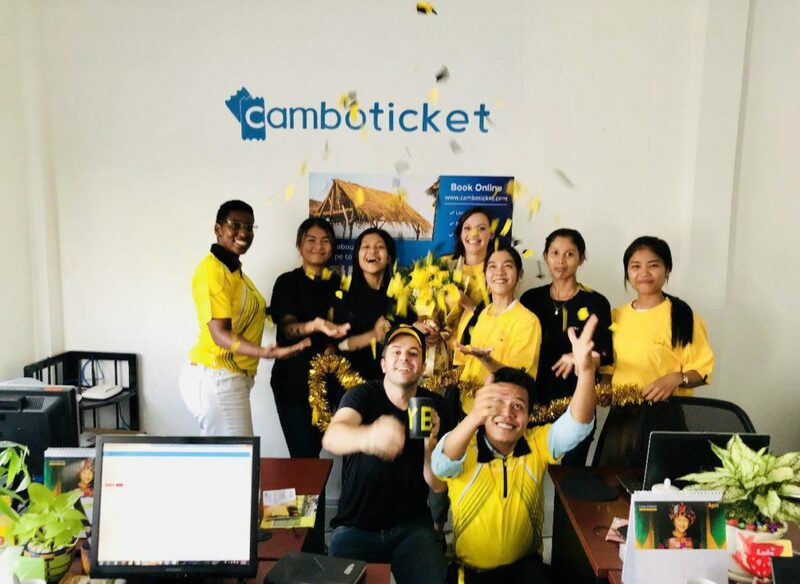 You can purchase your tickets through Camboticket and travel with Mekong Express or the well known Giant Ibis with several trips daily. For a more comfortable ride, especially if you are travelling in a group, feel free to book a private taxi and split the cost between family and friends. Spend some time in Cambodia and you will surely hear about the wonders of Kampot pepper. Kampot thrives on salt and pepper production and has a well-deserved reputation. 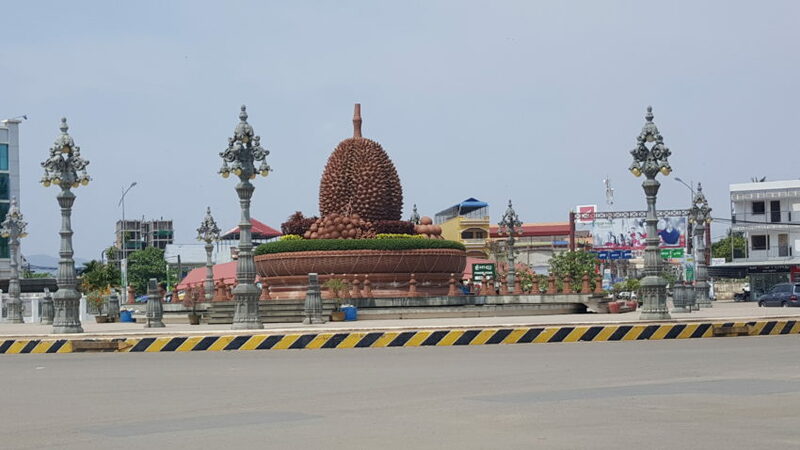 What might be less known is that Kampot is also the durian agricultural center of Cambodia. 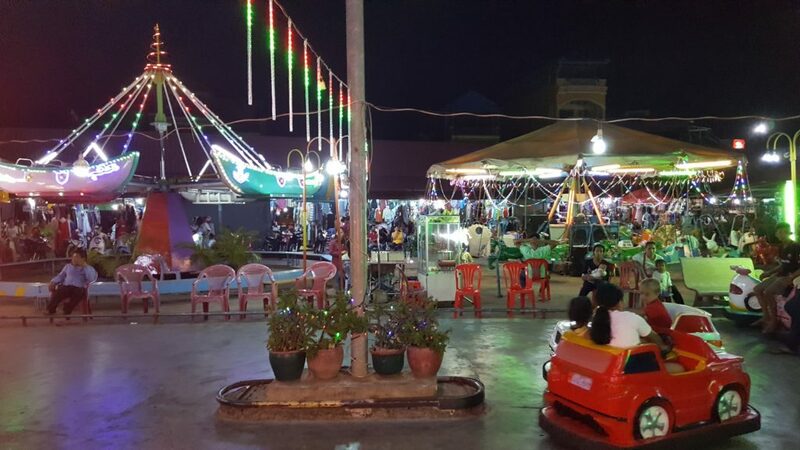 Look for the famous Durian Roundabout in town which is a prime photo opportunity and conveniently set across from the busy night market that boasts many carnival style rides to help entertain the children while you shop for some clothes or trinkets to remember your trip. 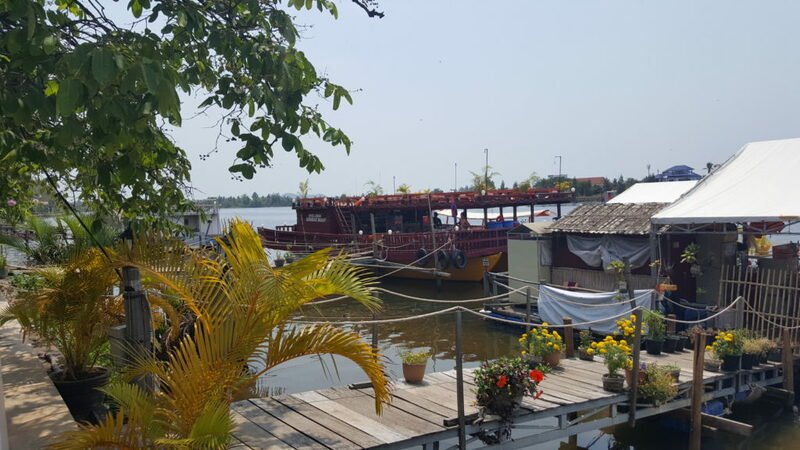 Kampot has quickly become one of the most popular locations for expats to retire and relocate to after they’ve grown tired of the hustle and bustle of Phnom Penh, and the land and property values have been soaring in the past few years due to the increased interest. One of the most attractive things about Kampot is the low costs on everything from room rentals, to food, to transportation. Even tourist activities like a boat cruise along the river will only set you back $2.50! Take a boat trip along the Preaek Teuk Chhu river, and enjoy inexpensive drinks and food while relaxing and soaking in the sun and breeze. The trip can be as long as you like, so plan on taking a couple of hours to navigate the waterways and see Kampot from a different point of view. West of Kampot is Preah Monivong Bokor National Park which is home to Bokor mountain, with some wonderful paths to hike and explore. Visit the wonderful Popokil Waterfall (northeast of Bokor hill station) which has a shallow pool in between two cascading waterfalls. End a long day of hiking with a trip to the casino at the base of the mountain peak! Outside of the city there is also an old semi-abandoned zoo where you can make a side trip. You can see and feed monkeys, ostriches, elephants, a camel, and other assorted birds and creatures. Should you choose to go to the zoo, purchase a couple of bunches of bananas for animal feeding in town prior to leaving as there are no vendors in the once popular zoo that has fallen on tough times. 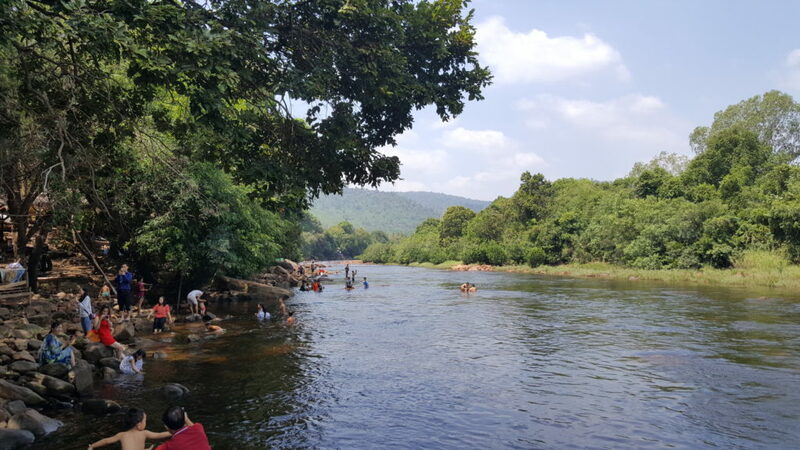 Further up the Tuek Chhu road is a nice river area with restaurants alongside the rapids area that is popular with locals and tourists alike who are looking to cool off in the hot sun. You can order a roast chicken and sit in the shade as you watch the flow of the river. You can also mosey on down to the bank and purchase some bargain street food. Be advised that there is a small fee to drive into this National Forest area. The town is not very large but there are a plethora of small restaurants and dining options that serve quality food at affordable prices. Most of the hip places to eat are near the old market section of town. If you are looking for the best burger in town you would be remiss to not stop into the Laundry Cafe where you can get your laundry done while eating the highest quality Australian beef burgers. For top-end seafood and spectacular service look no further than the Kampot Fish Market which is a top quality restaurant built in a historic building that used to host the original fish market in the 1930’s. Other top mentions for dining in Kampot are Armandos (Italian) and Simon’s (Indian). Don’t forget to save room after dinner for ice cream or fresh-baked cookie from Kampot Pie & Ice Cream Palace. If you want to have a cocktail or beer after a busy day of doing nothing or exploring the forests outside the city we recommend you cosy up to a chair in the Rusty Keyhole (two locations in town), Birds Nest, or The Stumble Inn. Avoid the crowds and enjoy a more tranquil holiday in Kampot! Ready to go? Book your ticket now!